Kicking off on Saturday morning will be the first of more than 130 games of exciting football being played at Park Island over the labour weekend. Some of the biggest clubs from all over Aotearoa will be competing for the trophy, currently held by Birkenhead United after they beat Western Springs in an action-packed final last year, retaining the cup for the second year in a row. 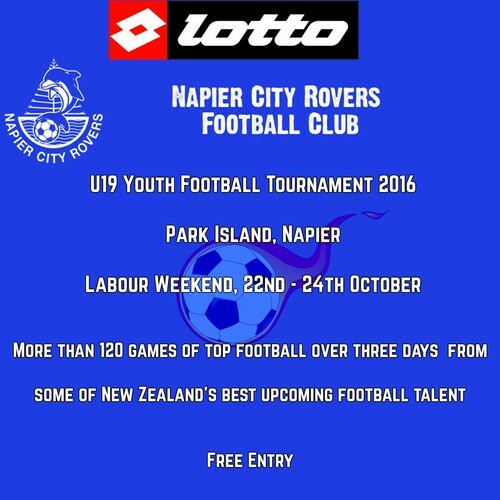 Hosts Napier City Rovers will be showcasing their cream of the crop of youth players, fielding one of the youngest team in the competition. Over the years many young players have played in the tournament and went on to gain international status. Come along, enjoy the carnival atmosphere, and witness some of New Zealand football’s future stars in action. The group stages kick-off at Park Island, Saturday 9am. The quarterfinals will be held on Sunday at 3:30pm; the semi-finals at 9am holiday Monday. The top two who emerge will face-off in the big final, which will be played out at Bluewater Stadium, 12:30pm, Monday.